Hello there, I feel privileged to be a CKG judge and little bit of me still cannot believe it. What an honour and privilege to be part of something so wonderful and inspirational. We were asked to read the books and at the same time check the books fitted into the criteria for the Carnegie and Kate Greenaway medals. It was not just reading for pleasure, but reading 254 books and having to judge them. I didn’t find it the easiest of tasks. I however did have help; I am an advocate of reading aloud and my two dogs have had to listen to quite a few passages from the lists. Always attentive and never judging! What struck me was the sheer quantity, variety and scope of books I came across. The unbelievable mix of writing and illustration talent that is present in children’s books. I have read books which have made me cry, laugh, think and be challenged. What a cornucopia of marvelous books came into my hands. It has widened my reading horizons. I have read and learned from books that I would not have picked up previously. So do not judge a book by its cover… I didn’t have that luxury and I am so pleased I didn’t. I have been shadowing in schools and loved the interaction between the pupils and the Carnegie and Kate Greenaway shortlists. Seeing students read new genres, catching snippets of conversations, hearing people talking about books, language and pictures. It is a wonderful thing to hear a student champion a book with passion that is tangible. I have seen some students wipe away a tear and some laugh out loud. The Carnegie and Kate Greenaway Medals give us a chance to bring high quality books to the students’ attention. It is great to see the empathy for other people in new situations that is found through reading. 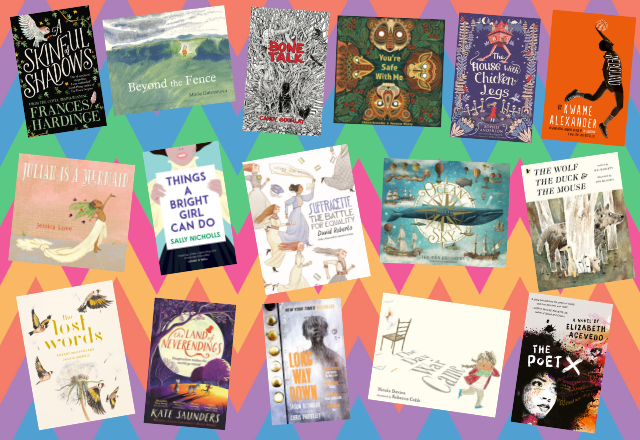 The books shortlisted this year of 2019 are, in my opinion, an awesome group of books and I really hope having read them all you will agree. Finding an outright winner in the Carnegie and Kate Greenaway Medals is a challenge. So, I wish you well in choosing winners for the Shadowers’ Choice Award. To all you CKG shadowers out there… Good luck and happy reading. I am a lover of books. A book lover. When I hear myself talking about books I say things like “I adore this book”,“this book made my heart sing”,“I never wanted this book to end”, “I was up all night with this book”, “This book made me cry/laugh/write/dance around the room/want to run away to sea/join a circus” (delete as appropriate). I am a lover of books and this is the language of passion. As a book lover I love the whole of a book, I am entranced with the essential nature of it, its charm, the cut of its jib, its swagger and sway. I pass over its imperfections (if I even notice them at all while I’m busy in its company). Often the imperfections themselves make a book special to me. But to take the role as a CKG Judge seriously I had to become a surgeon, not just a lover of books. I had to cut into each book’s surface and look at its spine, its muscles, its sinews, its lifeblood. I had to study the imperfections, to weigh them up, to put my feelings towards certain types of books, for particular authors and illustrators aside. It was difficult. It was even upsetting at times but it had to be done. I had to become a different kind of reader. I turned to writers for guidance with the Carnegie Medal judging process. Writers dedicate their lives and livelihoods to their art, so who better to go to for guidance? I read Stephen King’s illuminating and inspiring manual-come-autobiography On Writing: A Memoir of the Craft and noted his dislike for adverbs and the overuse of adjectives. “Show don’t tell,” is his repeated advice. Yet simplicity is often deceptively difficult. Anton Chekhov is often credited as writing, “Don’t tell me the moon is shining; show me the glint of light on broken glass.” Learning to see this art clearly was vital to my new skill set. Well-crafted exposition is difficult to spot; poorly crafted exposition isn’t, once you start to look carefully. If a passage is dragging (especially near the beginning of a book) then a lot of the time it will be because the background information, the exposition, hasn’t been ground up finely enough. Le Guin also writes in Steering The Craft: “A story is made out of language, and language can and does express delight in itself just as music does.” When language expresses this delight in itself you can’t help but notice it. It takes outstanding writers to achieve this but it doesn’t have to be difficult or hard to access. I also turned to my friend and picture book expert Melanie McGilloway aka @LibraryMice for guidance in developing Greenaway Medal judging skills. She lent me a large collection of books and this was a huge help. They expanded my visual literacy skills, ensured I could really ‘see’ skillful illustration clearly and helped me to be confident in using the language with which to discuss it. The extraordinary book Picture This by Molly Bang uses illustration to teach visual literacy, composition and the psychology of visual storytelling in a playful way. It made me look at every illustration and think about the many choices involved in its creation. It showed me how absolutely every part of an outstanding illustrated book has been thought through and is as it is for a reason. This might sound obvious but until you really start looking at illustrations and thinking about them carefully it is all too easy to look at but not ‘see’ the artistry. Reading Picture Books With Children by Megan Dowd Lambert teaches adult readers how to start conversations and discussions about visual literacy. I imagined reading the 117 nominated Greenaway titles aloud to my readers at school and talked myself through her ‘whole book approach’ as I studied each page. Greenaway Shadowing groups might find her Whole Book Approach Tweets from November 2016 really helpful when they are looking at the judging criteria as she included lots of examples. I am at the midpoint in my time as a CKG Judge now. The Shortlists for 2019 are out and I am re-reading these extraordinary books and studying them even closer than before. I am also busy reading books that are eligible for 2020 because any day could see the publication of a CKG 2020 winner and I want to have given all of the nominations the best consideration that I can. Has becoming a CKG Judge dampened this book lover’s passion for books? Absolutely not. Does the surgeon love the sinews? Absolutely. This last year and a half has taught me to see the beauty in the bones beneath the skin, to really appreciate the skill in the hand of the maker. It has deepened my love of children’s literature immeasurably because I have a deeper understanding of it and of the vast variety of voices and visions out there. One of the joys (and there have been so many) of being a regional judge has been the reaction of pupils who have enthusiastically followed the judging process alongside me, and have even taken on the role of CKG judge within school as they shadow the awards. Over the last two years, I have loved the animated, and sometimes fierce discussion on judging days. The adrenaline fuelled intensity of those meetings is unlike anything I’ve experienced anywhere else. It has been brilliant to see judging meetings reflected in book club as young readers gain the confidence to speak up in a group of their peers to defend or champion a book they have read and feel passionately about. With the introduction of the Shadowers’ Choice Award this year, book club might begin to echo judging meetings even more strongly! Certainly, for myself, and also the shadowers in school, reading CKG titles has introduced new authors and led to the discovery of new books. I often feel a wee burst of pride when I overhear one of the shadowing group recommend a CKG title to another reader and support their recommendation with comments on character, plot and style. We have had our first few shadowing meetings of the year and the excitement is already building. A Porter pushing, loaded high. Seeing the world through others’ eyes. Will books be laid aside at last? 2017 was the year I turned 50. It could not have had a better start, with a new job as a School Librarian at Victoria College. I loved my previous job as part of the Special Collections & Archives team at QUB, but at heart I will always be a school librarian and this was too big an opportunity to miss: a school which caters not only for 11-18 year olds, but also has a Prep department and a nursery. Life, I thought, couldn’t get any better. Having regarded CKG Judges as an elite breed of SuperLibrarian, a kind of hero; I admit that joining them was more than a little daunting, but excitement will always win over nerves and I’m so glad it did. Just as I hit half a century, the CKG year took off with judges’ training and this was quickly followed by the arrival of parcels and piles of gorgeous books. Always a reader, all those years of practice were put to good use, as was an ability to ignore any commotion (and chores) to focus on the written and illustrated pages. As with the best stories, things were definitely going too smoothly! Faced with reading 237 books, I do not recommend a broken wrist. While the extra time off work was definitely appreciated, it wasn’t so easy to hold a book, especially when trying to make notes at the same time. And as for typing them up…There may have been a few tears! The judging meetings were intense and exhilarating and exhausting and adrenaline-fuelled, and that’s all I’ll say about those. The most rewarding part of the year has undoubtedly been sharing the books with the pupils in school. Shadowing with the Book Club has been a lot of fun as the pupils have reacted so openly to the shortlisted books and they have been really keen to recommend them to friends, classmates and family. It has been fascinating to compare the reactions of the older girls to those in P2 or P3. I especially enjoyed watching two year 8s reading one of the picture books together, every reaction and emotion showing on their faces as they turned the pages. Pure gold.